This morning I woke up to find that I had run out of blog posts to put up, all I've got lined up at the moment are a few beauty reviews. I spent a good few hours brain-storming and procrastinating and thought that I would have a go at creating my own tag. I wasn't sure whether I would actually post it just in case it is a big fail but I have nothing else to post so lets give it a go! We all have days where we aren't feeling too great and we can easily forget the things that make us smile. 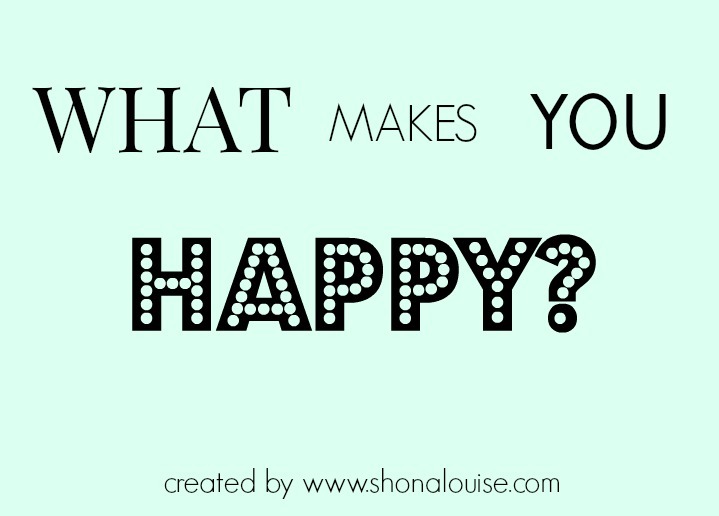 I thought it would be really nice to think about what and who makes you happy in your life. Not only will it make you think about what/who truly makes you happy but your answers will also be there to look back on when your day isn't going so great. I really enjoyed thinking about and documenting the things that make me happy, I hope you do too! If you do my tag please link back to this post in your post, thank you! My Mum makes me happy, she always knows the right thing to say and does a great job of cheering me up when I'm having a bad day! Hannah also makes me happy for similar reasons, I know she is always there to talk to and we are always laughing and smiling when we get together, I couldn't ask for a better friend. Sarah is always making me laugh, she is constantly smiling and having fun and I think that definitely rubs off on me when I'm around her! Bex and her son Jack make me happy, seeing their relationship just makes me smile, she is an amazing Mum to him and you can see that he loves her a lot. Going shopping always makes me happy, even if I don't buy anything I could browse through shops all day long. I find it so relaxing and it definitely makes me a lot happier at the end of the day! Although I haven't done it in it a while swimming makes me very happy, again it is relaxing and one of the only sports that I can do without being in pain, being in water makes me forget about everything negative going on in my life. Days at the beach are one of the things that I love doing the most, I could sit on the beach reading a book all day. I grew up going on holiday to Cornwall every year so I feel really comfortable in the sea and on the beach, it feels so peaceful even if there are lots of people around me. Blogging is an obvious choice, I wouldn't be writing this post if blogging didn't make me happy. Even after nearly 3 years of doing this I still look forward to writing a new post. Finally sunny weather makes me happy, I think it makes everyone a lot happier! Warm weather brings so many things with it like going on walks or having an ice cream, I wake up looking forward to the day a lot more when the sun is shining. As I already mentioned the beach makes me happy, specifically I'm happiest on the beach when I have an ice cream and a book! My garden makes me really happy, a bit of a weird one but hear me out! I spend a lot of time in my garden reading or just staring up at the clouds but I also spend a lot of time with my younger brother in the garden. We don't spend an awful lot of time together now he is a teenage boy but it seems we always cross paths in the garden, we spend a lot of time laughing together which is nice, he is a pain but I love him a lot. Again I've sort of already mentioned this but Cornwall makes me very happy. Growing up myself and my family went to the same place every year in Cornwall and some of my happiest memories are from our holidays down there. If you offered me the chance to move there I probably would straight away! I know there are only 3 questions but obviously your answers are going to be a bit longer than the average answer for a question from a tag. I hope if you do my tag you enjoy doing it! I love the idea of this tag Shona! I haven't blogged for nearly two months as I haven't been having a great time recently but I would love to give this tag a go to ease myself back into blogging as I've been missing it quite a bit more recently. It's always nice to reflect on the (not so materialistic) things in life that really make us happy!